Reedsville, WV — 05/01/2015 — For over 40 years, the Delano’s brand has been a part of the Preston County business community. The family-owned stores were originally named for West Virginia native Delano Fultz. 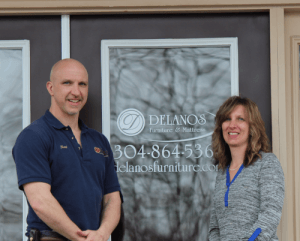 Over the past twenty years, Delano’s son Kent and daughter-in-law Melissa have built their business into what is now Delano’s Furniture & Mattress. Their two retail locations showcase quality furniture at affordable prices, and crafted within the United States whenever possible. Kent and Melissa Fultz, outside their Delano’s Furniture & Mattress store in Reedsville, West Virginia. In recent years, Kent Fultz began to source mattress sets that were American-made. When he discovered Imperial Bedding Company, he knew he had found something unique. Fultz hand-picked his favorite nine Imperial mattresses to create his exclusive ‘Almost Heaven’ Collection. This complete line of bedding is created in West Virginia by the Imperial Bedding Company, using all American-made components. Much like Delano’s, Imperial has been family-owned and operated since 1969. The company is located just outside of Huntington and employs over 80 local craftsmen. In addition to the ‘Almost Heaven’ Collection, Imperial Bedding proudly manufactures luxury mattresses for The Greenbrier Resort and West Virginia State Park lodges as well. The ‘Almost Heaven’ phrase has a long tradition of being paired with West Virginia, as a result of John Denver’s song “Country Roads”. By the 1980’s, when the state transitioned away from the using the slogan, Imperial owner Ronnie Rowe registered “Almost Heaven” as a brand name for one of his mattresses. A few years later, those two iconic words would be used for one of Imperial’s most popular mattress models. Why should I buy my next mattress from Delano’s Furniture and Mattress?